The London Guarantee Building is located at 360 N. Michigan Avenue in Chicago, Illinois and was completed in 1923. This building was designed by Alfred S. Alschuler and stands 318 feet tall with 22 floors. The London Guarantee was completed in the Beaux Arts-style Classical Revival style of architecture and stands at the site of the Fort Dearborn Blockhouse. 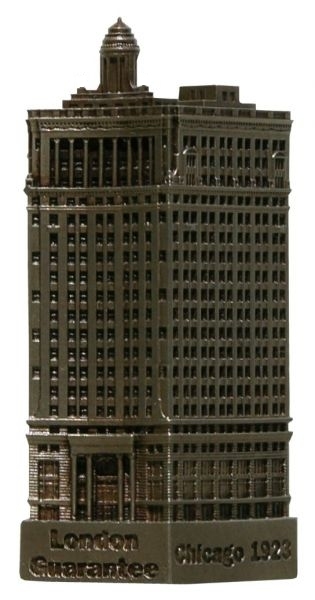 This pewter replica stands 3-1/2" tall at 1" = 100 feet. This model is finished in antique pewter with a brown stain. Fantastic Detail and a lot of visual interest.